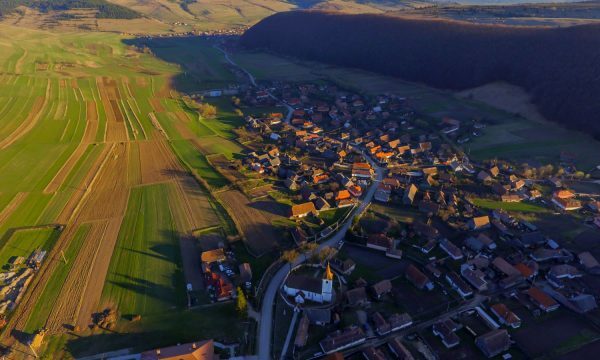 The village is situated on the periphery of the Ciucului de Jos (Hu: Alcsíki) basin, east of Miercurea Ciuc (Hu: Csíkszereda), in the valley of the Tapolca stream. According to scholars the village name originates either from the noun mén meaning “stallion” and ság meanin “hill”, or from Saint Mennas of the Eastern Church (assumed to have lived in the 3th-4th century), one of the first adepts of Christianity, refusing to recant his faith. The settlement is mentioned in historical sources in 1567 by the name Menessagh as the biggest village of the area, having 67 houses. According to 1643 written sources, the rather large village was reported as having more than 250 families. This number grew up to 2178 locals by the 1910s. Considering the modern age, we know from archive records that the village had a functioning school for a short while, and between 1919–1920 a kindergarten; we know that out of 78 children only 12 attended nursery school. Restoration works of historic buildings create ample opportunities for performing archaeological research, which otherwise would not take place, and not merely for lack of financial resources). This is valid also in the case of Roman-Catholic church of Armăşeni. Archaeological excavations were conducted twice, once in 1999 by Daniela Marcu Istrate and later in 2007, when Botár István preformed research in the interior area of the church. The archaeological research yielded in both cases similar results, with a few exceptions regarding the periodization of the site. These are common for all village parishes throughout Transylvania. In the Árpád period, the village had a small, humble rectangular church functioning as a parish. Later, in the 14th and 15th centuries, it was expanded, and equipped with a polygonal sanctuary, buttresses and sacristy. When a new, more robust triumphal arch was added, the southern side of the church also gained a set of buttresses, in order to release any outward thrusts caused by the new architectural element. In the 16th century, together with the growth of congregations, churches suffered more modifications, and were redecorated. In Armăşeni, the nave and the sanctuary were enlarged and lengthened, and on the south side buttresses were added, ensuring the stability of the new structure with longer span. Looking for accomodation around Armăşeni? Click the button below, and you can find a suitable place in just a few minutes.